1. The Thunder will be out for revenge. In their previous meeting, the Mavericks humbled the Thunder, in Oklahoma City, to the tune of a 23 point drubbing, 109-86. That was the beginning of the Russell Westbrook Rest Experiment (RWRE). 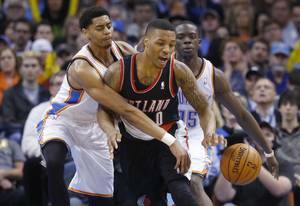 The Thunder came out a little flat and never recovered from a bad start. The Thunder were down three starters and the 3’s kept falling for the Mavericks (13-24 3pt FG, 54.2%). Needless to say, it was one of the worst losses at home since the team became a playoff contender 4 seasons ago. 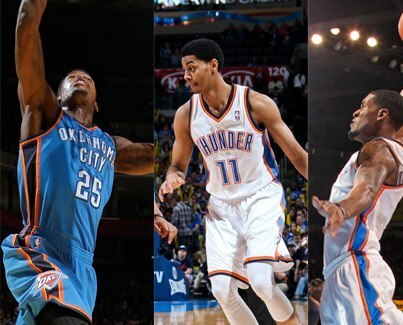 This time around, though, they have Russell Westbrook in tow and a little momentum gained from a 4 game winning streak. 2. 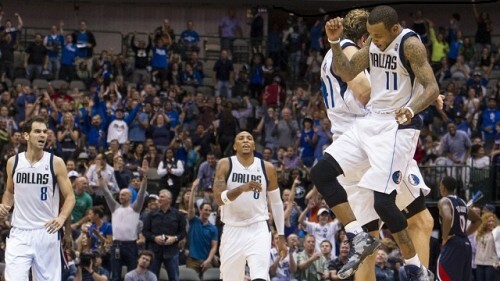 The Mavericks are fighting for their playoff lives. The Mavs were given one of the greatest gifts afforded to a team looking to secure one of the final spots in the playoffs: an 8-game home stand. They are 2-2 through the first 4 games and have slipped down to the 9th spot by virtue of a tie-breaker with Phoenix. If the Thunder come out flat-flooted, they may just run into a desperate animal needing to win as many games as possible to secure a playoff seed. 3. The Thunder are fighting for their own playoff seeding. A lot like last season the Thunder find themselves behind the Spurs with about 12 games to play. They have one more meeting with the Spurs in early April at home. If the Thunder could position themselves to be a game behind the Spurs when the meet on April 3rd, then they could take over first place, not only in the Western Conference, but also for the entire playoff run if they make it to the Finals. OKC already owns the tie-breaker by virtue of winning the first 2 games against the Spurs this season and San Antonio has a tendency to rest its players the final month of the season. The Mavericks currently find themselves outside of the playoff race in the Western Conference with the same record as the 8th seeded Phoenix Suns, at 42-29. Phoenix owns the tie-breaker by virtue of having the better conference record. The Mavs are a good offensive team, scoring 104.6 points a game, but rank near the bottom third of the league in terms of opponent’s points per game, allowing 102.3. 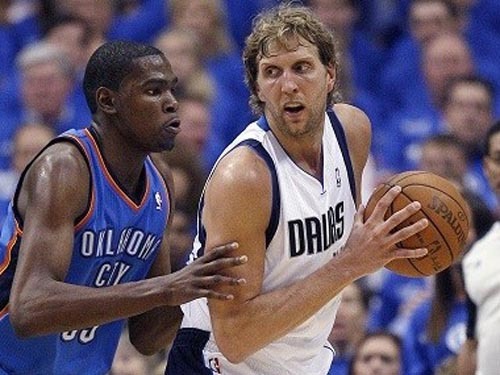 In their current home stand, the Mavs are 2-2, with defense being the main culprit. In the 2 wins, they only allow 97.5 points per game, while in the 2 losses, they’ve allowed 115 points per game. Dirk Nowitzki and Monta Ellis do the heavy lifting on the offense, but Jose Calderon is the one who sets it in motion. Calderon, who took a hit to the face that limited him to one minute in their last game, will play in this game. The Mavs boast a veteran-laden bench that can give teams fits with players like Devin Harris, Vince Carter, and Brandan Wright. 1. Perimeter Defense – Anytime the Thunder made a push in the last game, the Mavs usually answered with a 3-pointer to keep the Thunder at bay. The Thunder allowed the Mavs to shoot over 50% from 3-point territory in the last game, which would make it difficult for any team to win. 2. Bench help – While the Thunder bench was a bit muted in the last game by injuries, there should be no reason why the Mavs’ bench outscored the Thunder bench by 16 (38-22). 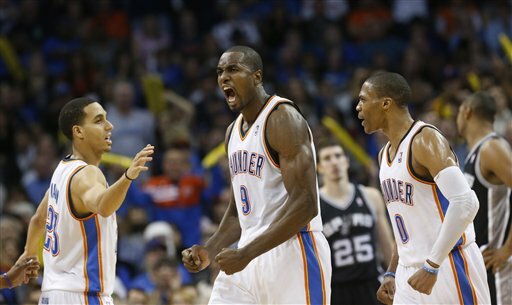 The Thunder will face more of the same tonight, with Thabo Sefolosha and Kendrick Perkins still out. 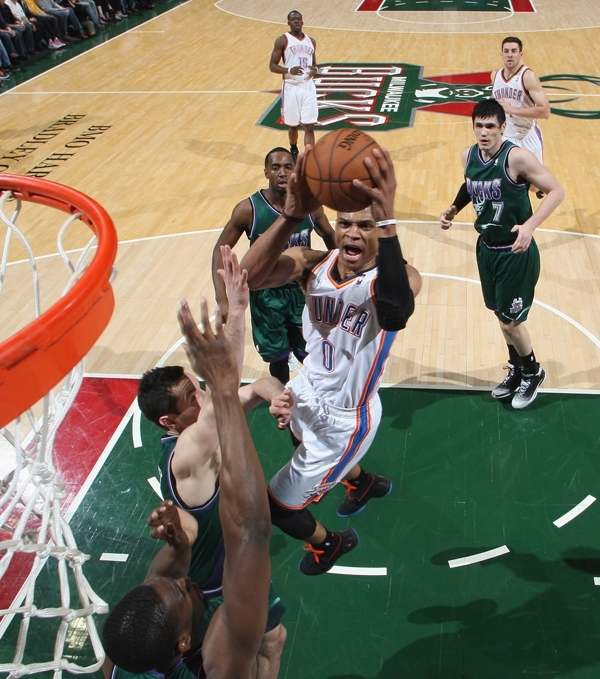 Having Reggie Jackson back in his familiar 6th man role should help the bench unit out. 3. Russ’ knee – The MRI performed on Saturday revealed no further damage to Westbrook’s right knee. That’s the good news. But we are kind heading into unchartered territory as a fan base where we grimace every time Russell takes a tumble or grimaces in pain. Here’s to hoping he suffers no further scares the rest of the season (regular and post). One word to describe this week: tiring. With a 4 game West-Coast trip, every game usually finished around midnight, our time. And all 4 games were close enough that you had to watch them in their entirety. No blow-outs this week. There comes a game in every season where you just sit back and say, “Wow, the refs got that all wrong.” Two years ago, in a tightly contested overtime thriller against the Utah Jazz, they got the benefit of a no-call at the final horn to escape with a 1 point victory at home. 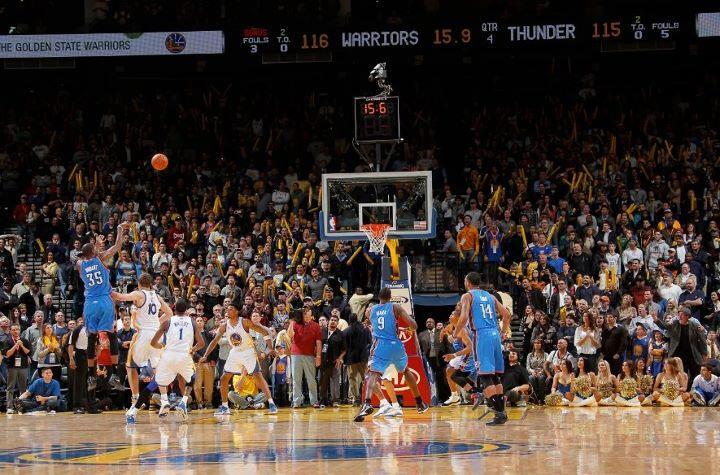 It was very apparent that Kevin Durant was hacked as he attempted the last second 3-pt heave. But the refs swallowed their whistles and the game went down in the record books as a Jazz victory. A day later, the NBA apologized because it had gotten the call wrong. 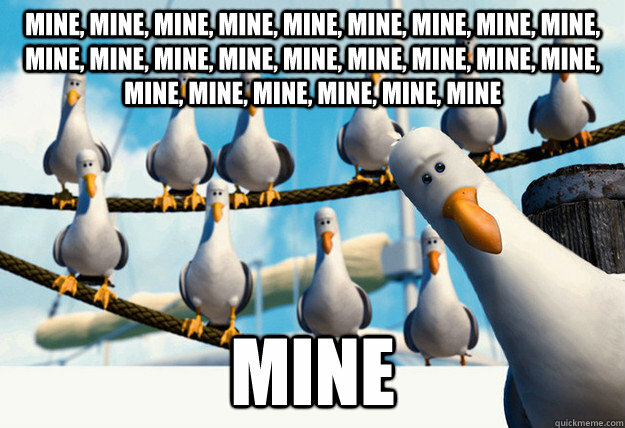 Fast forward to the Portland game on Monday. 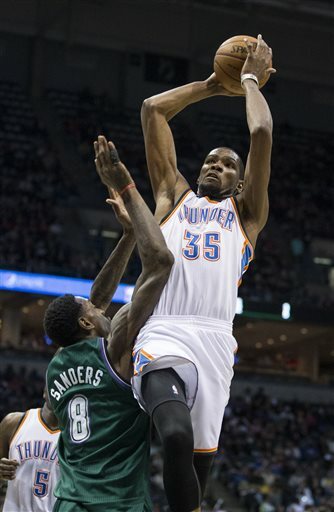 With 7 seconds left, KD drove to the basket with the Thunder down by 2. At the same time that the ball hit the backboard, LaMarcus Aldridge swatted the ball from behind. A close call, but the refs called a goal-tend and awarded the two points to Durant to tie the game. 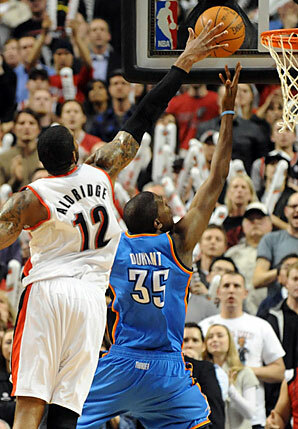 After a failed attempt by the Trailblazers at the end of regulation, the Thunder used timely scoring from their big three (Durant, Russell Westbrook, and James Harden) and great defense by Kendrick Perkins on LaMarcus Aldridge to pull out a 111 – 107 victory. A day later, the NBA apologized for the blown call by the refs in awarding the goal-tending call to Durant. Sometime you’re the hammer, and sometimes you’re the nail. Golden State games are the only games that give me heartburn, especially if they are in Oakland. Hypothetically, looking at the records, we should be able to clamp down defensively on this team and cruise to an easy victory. But for some reason, be that style of play or the fact that our defensive weaknesses match up so poorly with their offensive strengths, we can never quite have a comfortable lead against this team. We usually end up winning, but it a very close affair all the way until the end. In the last four seasons, including this one, we are 9 – 4 against the Warriors, but the average score has been a “too close for comfort” 111 – 109. And why would Tuesday night by any different? The game was actually a microcosm of the games these teams have played in the last 4 seasons. Every time someone pushed a lead to 7 points, the other team went a 12-1 run to capture the lead. No lead was safe. 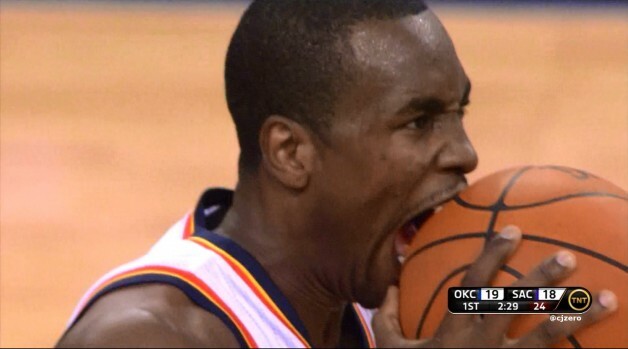 The torrid pace was fun, but many Thunder fans lost at least 1 year of their lives because of this game. The Warriors were led by Monta Ellis who had a career high 48 points and by David Lee who notched his 2nd career triple-double with 25 points, 11 boards, and 10 assists. 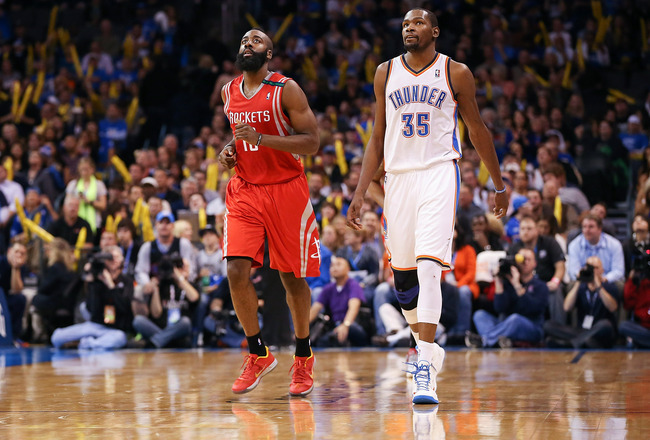 But while the Dubs had 2 great players, the Thunder relied on 4 players who between them scored 100 points (Durant (33), Westbrook (31), Harden (19) and Cook (17)). The 4th quarter was the Big 3 with a Cook show. 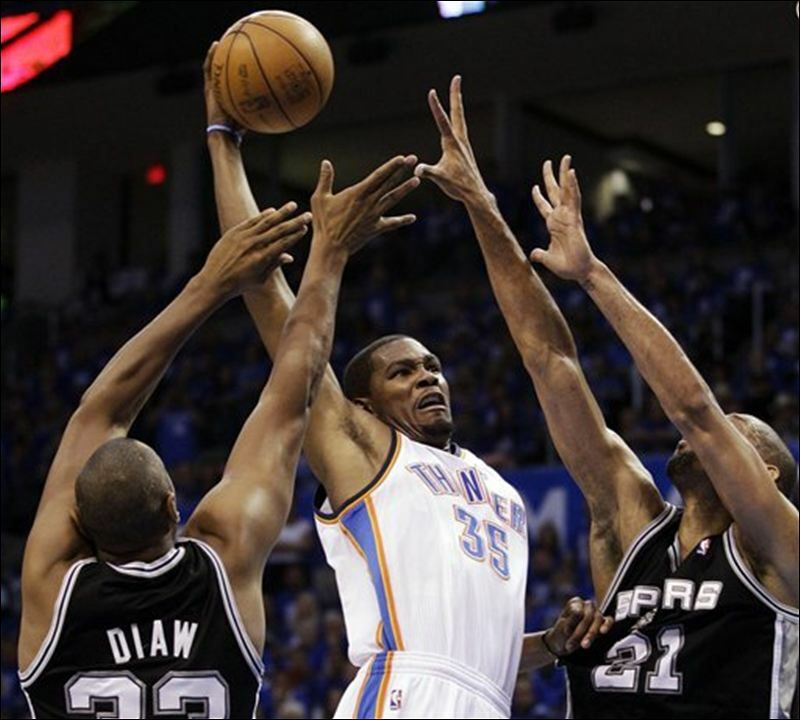 All 4 players provided timely baskets to keep the Thunder within striking distance throughout the 4th quarter. With 17 seconds to go and the Thunder down by 1, they went to ol’ reliable (Durant), who went to the bank and put the Thunder up by 1. The Warriors didn’t score the rest of the way. 119-116 Thunder. And on the middle day of a back to back West Coast sandwich, Thunder Nation rested. If there was one game in this set where you said to yourself, “This is going to be an easy game,” this was definitely it. A young, inconsistent team who had fired their coach earlier in the season and had 2 mercurial young stars (Tyreke Evans and DeMarcus Cousins). On paper, this was a gimme. But, as the saying goes, this is why you play the game. The Thunder pulled the same M.O. from their 2 games; keep it close, apply the clamps at the end, and make timely shots. The only problem was that the Kings shook the clamps off late in the 4th quarter and those timely shots weren’t falling for the Thunder in this game. In their only nationally televised game, with a playoff atmosphere that hadn’t been seen since the glory days of Chris Webber and Vlade Divac, and a raucous crowd that was all blacked-out, the young Kings rose to the occasion and outlasted the Thunder 106-101. 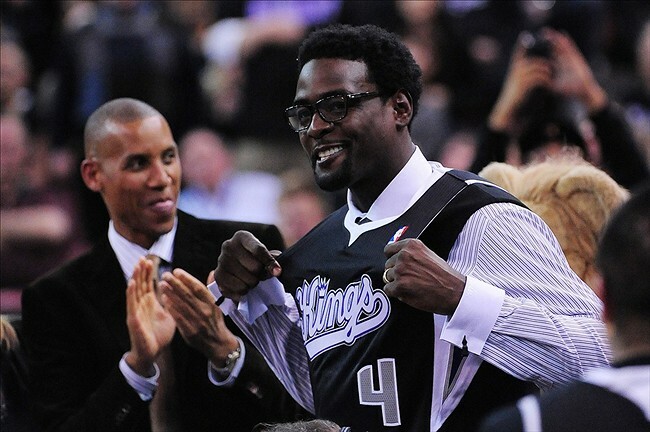 Was there any reason to think that the Thunder would win when Chris Webber shows up to call a game and ends up putting a Kings jersey on? There are just some games where everything works out for you. In a game where Durant deferred offensively, Russell Westbrook happily stepped up and scored 28 points on 10 – 20 shooting. It just felt like one of those games where we held the Jazz at bay, but knew that they could string together a 10-1 run at any point. It never materialized, in part to the double doubles posted by each Kendrick Perkin and Serge Ibaka, which negated anything from the Jazz’s front court duo of Al Jefferson and Paul Millsap. 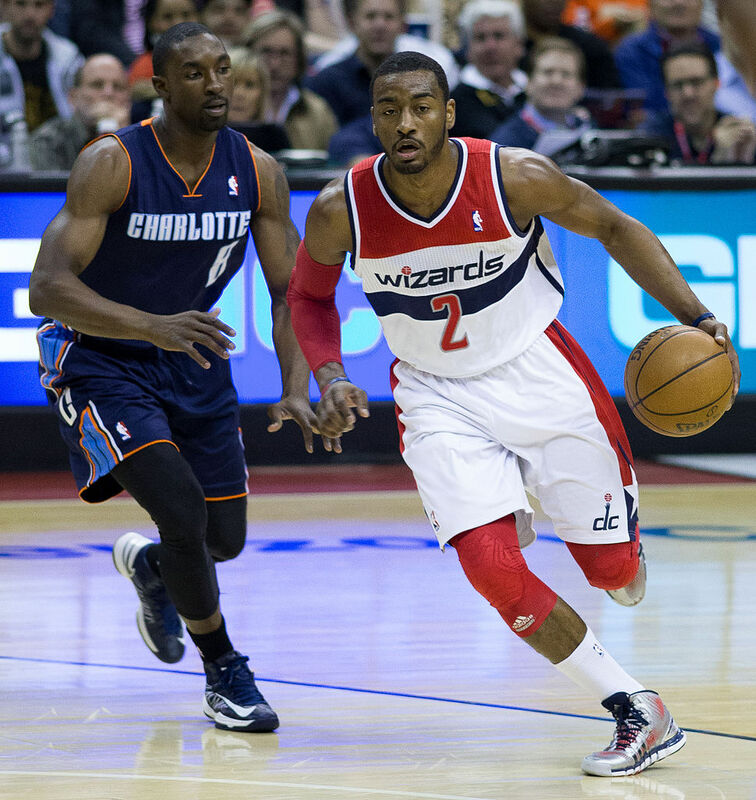 The Thunder coasted in the second half to a 101 – 87 victory. In a week where Durant and Westbrook averaged nearly 30 ppg each and hit timely shots, this week’s award is going to someone on the defensive end. 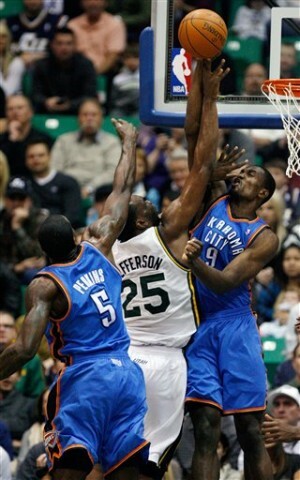 If there was a picture next to the words ‘interior defender’, it would be of Serge Ibaka. For the week, his ridiculous stat line was as follows – 4 games played (10.3 ppg on 55% FG shooting and 82% FT shooting, 9.8 boards per game (with 4 per game coming offensively), and 4 blocks per game). He single handily kept us in games with his offensive rebounding and paint protection. 1. Russell Westbrook’s assist numbers (or lack thereof) are really starting to worry me. I completely understand that our offense is iso-oriented and Durant and Harden’s assist numbers are going up. But I think a lot of our early game struggles are due to the fact that we are not finding a groove offensively with the first unit and instead have to wait until the 2nd unit gets in to find any kind of cohesiveness on the offensive end. If Russell would think involvement instead of attack when the game starts, I think that would make a lot more things open up for the starters earlier in the game. 2. Some teams have no closers. Some teams only have one. But we have the luxury of having 2. Durant and Westbrook were mostly great in their late game executions this week. Westbrook had the mid-range game working late in games and Durant hit the big shot when it needed to be hit (even if he had a little help from the refs on one of those occasions). 3. Turnovers, turnovers, turnovers. A lot of the reason why teams are able to hang around till the end with us is because of our penchant for turning the ball over. If this number goes down, the number of close games will probably go down to.